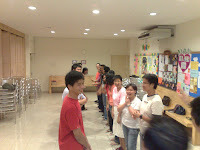 During that night meeting, pastor ben used a difference way to bring out the leadership training - PLAY GAME. It seems like everyone has had a good time. And the conclusion of the game is, when something goes wrong, BLAME yourself first before pin point the persons beside you. Ha ha. Is my fault! 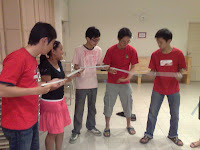 Pictures show we used the 'u' channel to pass the ping pong ball and tennis ball from one end to the other end.